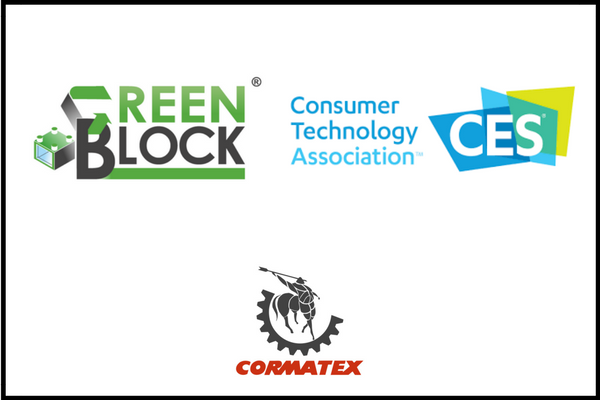 As a continuous effort in developing and promoting technologies to serve the growth of Circular Economy, Cormatex will take part to the next CES exhibition in Las Vegas (Booth 1519G – Tech East, LVCC, Las Vegas) from the 9th to the 12th of January by presenting an innovative project called GREEN BLOCK. Green Block is an innovative Green Building system that integrates advanced solutions to maximize Energy Efficiency and to dramatically reduce the impact on the environment as well as cost and building time. The project has been developed by a consortium of 4 Italian companies (AE.C.I. s.r.l. , Cormatex s.r.l., INGE.CO. S.r.l. and Elastrade s.r.l.) and Cormatex special Airlay technology provided a variety of thermal and acoustic insulating products used in Green Block that are all made of recycled waste materials (such as textile waste, tire cord, PU and Latex waste from mattresses and many others). “Green Block is an essential opportunity for Cormatex to demonstrate that the recycled materials developed with our special Airlay technology are applicable on the market as they perform as well as virgin insulating materials but provides huge economical and environmental advantages” says Luca Querci Managing Director of Cormatex. Green Block is applicable to residential, commercial or industrial buildings up to 4 storeys above the floor and its structural frame is based on a special patented Aluminium alloy that makes the whole building completely recyclable and the assembly very fast and cost effective. Have a look at the website www.green-block.it and brochure to learn more on GREEN BLOCK.